As we all know the state of the repossession industry has changed drastically in the last few years. What was once a very lucrative industry for all who ran their businesses well has become one of distrust and infighting that is seeing costs rise and revenues plummet. In the past, the relationship was lender-to-agent, today the relationship is lender-to-forwarder-to skip company-to-agent, or some variation. This has translated to a highly competitive arena that does not allow much room for movement, and has bred a sense of discourse across all levels of the industry. We have all read the articles, attended the trade shows, and spoken with peers who share similar lines of thinking that someone is to blame for this downward spiral from which nobody can seem to pull out of. We all have opinions as to who may be responsible, and we all have opinions on how to combat them. But, ultimately, who is to blame? What if I told you that it was you, the agency owner? Would you think I was some guy who was trying to pile on what is already a bad day? Then, what if I told you it may not be your fault? Would you ask me why?Now before I possibly offend you to the point where you stop reading, let me say that by the end I hope to get you thinking about your industry from a slightly different perspective. If I accomplish that, then I will have been successful. So, let’s start with the elephant in the room, the forwarders. Every agent who is street level cringes to some degree when they accept an assignment from any forwarder. Sure, there are some forwarding companies that just cater to the banks and seem not to care what happens in the field. There are others that do a good job of working with both their clients and their agents. 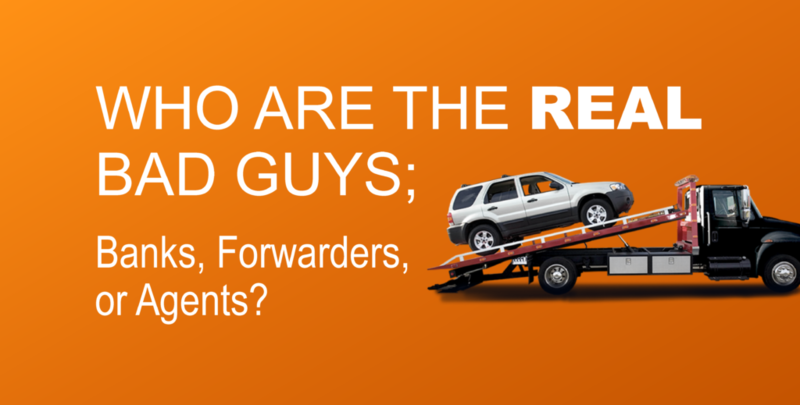 Of course speaking as an agency owner we would all like to see forwarders just go away. Well, folks, I will tell you that forwarders in whatever capacity are here to stay. They provide a service to lenders that is unique and attractive and therefore will be around for a long time. So are they the bad guy because they provide a service that others seem to need? Now let’s look at the lenders themselves. In the past, lenders would have a direct relationship with agency owners. Agents were able to develop a rapport with certain collectors, and as long as they performed, they had a mutually beneficial business relationship that would last years or longer. Well the problem was that large lenders needed a large staff to oversee a nationwide collection and repossession operation. That was a massively expensive effort. Along came forwarders, which convinced lenders they could outsource much of their collection and repossession operation through their company for the same prices they were paying for repossessions while also reducing the number of staff needed to manage that process across their lending footprint. This was, and remains, a can’t-lose scenario because in this case, savings equal profits. So are lenders the bad guy because they want to control costs in what was a money-sucking department? Ourselves, the agents. The agents are the ones at the bottom of this totem pole. The ones with the greatest risk physically and financially. The ones who work around the clock with dirty hands. We love the cat-and-mouse game that is repossessions. We love being in the field and calling the driver’s seat of our trucks our offices. It’s what gives us purpose. That’s why we get up every morning and keep fighting, despite how hard things are in the industry. We perform a service that not many people can and most people wouldn’t want to. But, with all that being, said we are our own worst enemy. We are in fact the bad guy! What makes us the bad guy? In one word….EDUCATION. By this I’m not talking about big name schools or fancy pieces of paper that cost tens of thousands of dollars to obtain. I’m talking about basic knowledge in how YOUR business is truly doing. Let me ask you one question that only you know the answer to. Are you truly profitable? I say these things because not long ago I was that guy who used to think “I’m picking up cars, I invoiced X amount of dollars this month. My bills are paid. I’m profitable.” But month after month, I kept wondering why I wasn’t building any savings, why I was just barely staying afloat. So I started doing some homework and with the help of people that had my best interests in mind, I began to receive that very education that I didn’t know I needed. Let’s face facts, we are repossessors, not doctors or lawyers or accountants. We do a difficult job and manage our finances the best way we know how. Some of us are more diligent than others. Some have a better understanding than others, but for the most part, we are who we are. This leads me to the bad guy part. We are so worried about volume and picking up as many cars as we can that we lose sight of the fact that we could be costing ourselves. Volume does not always equal profits. A lot of junk is still just junk. As an industry we have to learn that we can’t just run whatever assignments we can get our hands on for whatever prices we can. If we can learn to be more selective with our accepting of assignments we will change the industry for the better. What if I told you that you could say NO and become profitable? Actually turn down work, and not worry about whether the guy down the street is doing it and rest easy that you made a good decision? During my education process this was the hardest lesson I had to learn and I fought it kicking and screaming. What changed my thought process was to actually put pen to paper and, using a simple method, determine which clients were profitable for me and which weren’t. I can tell you I was shocked to learn who were good clients and who weren’t. If we truly understand our business and the costs of operating our businesses we would never have to worry about what Forwarder ABC was paying or how low a client reduced fees to because we would be able to say “No thank you.” Let your competition accept that work and eventually they won’t be your competition any longer. Now you’re probably asking what is this formula that opened my eyes? First, let’s start by figuring out what your average revenue per recovery. That’s probably something that every one of us could rattle off in a matter of seconds – total revenue divided by total recoveries. Pretty easy, right? Let me give you a scenario: Client A pays $375 per recovery and Client B pays $325 and both assignments come in at the same time. One would think that Client A’s assignment would be worked first because the average per recovery for that client is higher. Well, that’s where we all make the mistake. Revenue per recovery should not be the cure all for determining whether someone is a good client. I have found that the best overall way of determining the profitability of a client is by calculating the average revenue by assignment — total revenue divided by total assignments. For every assignment that comes through your office, how much are you invoicing? Use this calculation for your entire business — total revenue divided by total assignments, and then determine the average revenue per assignment. Let’s assume it’s about $200. Then, use the same method for each client — total revenue per client divided by total assignments per client. Any client that falls under your overall average needs to be re-evaluated. The best way to raise your average is to eliminate everyone under the company average. I am not suggesting to go and stop working for half of your client base. I am just giving you information that you can use in future negotiations. Of course there is more to this and something that I am willing to share to whomever would like to learn it. This is just a sample of the EDUCATION that can be used to make us all better business owners. I don’t have all the answers and I am not pretending that I do. What I have is a thirst for knowledge and a drive to be the best I can be and not just survive, but to prosper. If we can all arm ourselves with the knowledge that we will be ok if we say NO to a client we don’t want to do work for will we stop being the Bad Guy. Happy hunting, and stay safe out there! SPOT ON! I am reasonable but find I say no more than I used to. Higher invoices are only meaningful if you pick up the iron. I can only speak for my shop. I pass on assignments but the volume stays the same. I used to do flooring companies. Once did a 160 cars in a night. Reality… wasted for 2 days after, paid everybody and had some mad ( rightly so) clients. I dropped the ball on them and they send work daily. I just wont do dealerships any more. Run your own race. Remember all money isn’t necessarily good money. Thanks Scott! We’re glad you enjoyed the article.